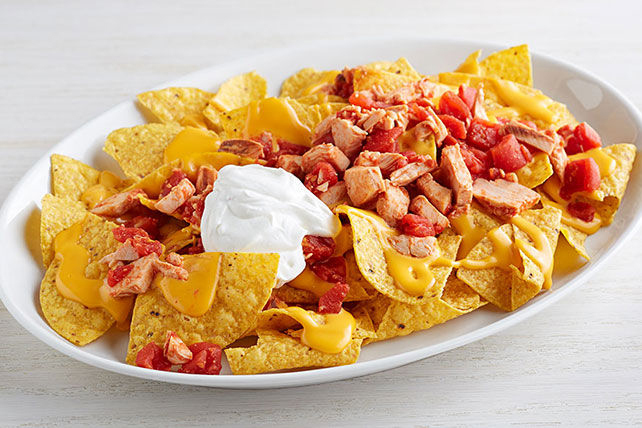 These hearty nachos layer warm cheese, sour cream and chili-seasoned chicken and tomatoes over tortilla chips. Serve as a tasty snack. Cook tomatoes, chicken and chili powder in saucepan on medium heat 5 to 7 min. or until heated through. Remove from heat. Microwave Cheez Whiz in medium microwaveable bowl on HIGH 1 min. ; stir until completely melted. Spread chips onto platter. Top with Cheez Whiz, tomato mixture and sour cream. Top with 1/4 cup sliced pickled jalapeño peppers just before serving.